This skiff is a real work of art and clearly aimed at the mega-sportfisher crowd where it would look great perched on the bow of a matching 80' Hatteras. They haven't posted a price yet but I can't imagine it costing less than $50k. Really interesting and you can see the whole thing here. Temple Fork's new BVK 7/8 fly reel is 5.2 ounces of perfection at only $250. I got to handle one for the first time yesterday and purchased it immediately. Just like their amazing BVK fly rods, this is another product where TFO could be charging twice the price and still sell them by the ton. For starters, just look at the design of this reel. It's like Leonardo DaVinci meets Caroll Shelby and they both go bonefishing with Lefty Kreh. The BVK is absolutely beautiful. It's machined from bar stock aluminum and the spool is ported in 96 places to reduce weight but not loose any strength. The BVK's frame, which looks like the wheel of an Orange County Chopper, holds drag system which is sealed and maintence free. The drag's adjustment nut on the frame's backside could be a little bigger since I found my fingers slipping as I cranked it to full throttle. This is my only gripe about the reel and it's an insignificant one at that. The drag itself is basically two small discs, one stainless steel and the other made of DuPont's Delrin plastic. It's incredibly smooth to engage and has a great sounding click. I'm a sucker for a nice sounding drag and I've bought other more expensive fly reels in the past totally based on that. 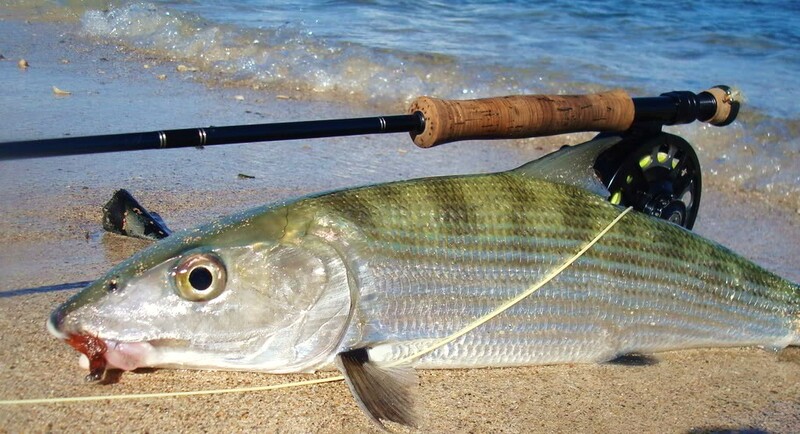 The BVK's drag is pure music and a big Key West bonefish would make it sound like the E Street Band on the deck of your flats boat. When I started saltwater fly fishing almost 20 years ago this type of reel did not exist. A Fin Nor Ahab was my first saltwater reel and I paid $380 for it, a fortune to me back then. It had a narrow spool with a small arbor and a thin cork drag that could never be tightened down enough. It's been hanging on my wall for almost ten years now because at 9.2 ounces, more than half a pound, Homeland Security won't let me have it in my carry-on bag. My old Fin Nor is so heavy that I could literally use it to smash someone's skull, so it made the No-Fly list. That's not the case with the BVK reel. It's as light and unobtrusive in your luggage as it is mounted to a fly rod. And I really recommend pairing it up with one of TFO's BVK rods. Strung up with a quality fly line and 200 yards of backing you'll have a $600 combo that's better than anything available just a few years ago. They're available right now at Florida Paddlesports if you're in the Cape Coral area and want to play with one. "This is a sport for Yankee Imperialists. Execute every fish in these waters immediately!" There is some excellent firsthand information on the Florida Sportsman Forum about Cuba and what it takes to get there and fish on your own boat. You can read Part 1, Part 2, and Part 3 of this post and in twenty minutes have far more information than you'll get after several days worth of phone calls to the State Department. Of course, all this will probably change if the Castro brothers ever manage to die and stay dead, something I've been waiting for from the first day I moved to Key West almost 20 years ago. 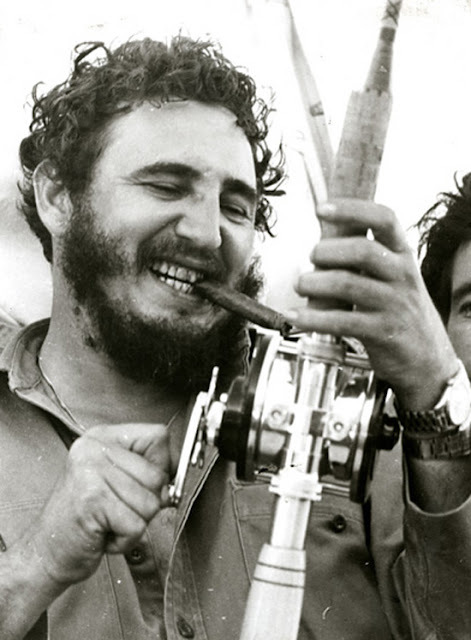 In a nutshell, Cuba is a fantastic experience but you're really after good fishing you're better off staying in Florida. Great. Now you're ready to hit the water like a man with the most badass topwater that $6 can buy. Congratulations on becoming a better fisherman just like that. But in all seriousness, if you're fishing for the Big Three here around Southwest Florida, the Spook should be your go-to artificial when the water's surface is free of grass. Snook, trout and reds can't resist it when they're hungry and the surface strikes are better than anything. It also works like magic on jacks, ladyfish, and juvenile tarpon. Even the miserable sailcats will hit it. The Zara Spook has been around for almost 50 years and it will continue to dominate for a long time to come. I've changed the site recently to make it more readable and give the photos a lot more detail. Hope you like it and pass it along to a friend. Mullet are everywhere right now but good luck trying to hook one on a fly rod. They're vegetarians and while that's a really annoying trait in both people and fish, they can be fooled. The 2 pound mullet in the photo above actually ate a 2/0 Puglisi baitfish fly. I got this one to eat by casting into a huge school and simply letting the fly sit dead still. This made the fly look like a floating hunk of algae and the mullet lightly mouthed it and I set the hook as soon as I felt the very slight bump. I've tried this hundreds of times over the years when I see schools of these fish and it's worked only half a dozen times. You can tie specific patterns to look like algae on tiny hooks and catch mullet regularly but I haven't tried it. I have a 5-wt that's collecting dust so I might give it a shot. They're actually a good fight and I really like eating them. Matlacha Pass is loaded with fish right now, especially during the morning's rising tides. These are some shots of the Slam that my dad caught using a white Zara Spook. This redfish hit first along the mangroves inside the Burnt Store Bar. I've been hearing from other guides and kayakers that there have been a pile of reds up there lately. The big schools of breeding size fish will show up next month but for now there are plenty of these guys available. This 22-incher's close encounter with dad's Spook earned him a one way trip to my grill. This 18 inch snook hit a few minutes later. Not a fantastic fish but there were clearly a pile of them under the bushes this morning. Every third cast got wacked into the air which is common behavior with mid-size snook. The hooks found this one and he went right back in the water after the photo. There are also a bunch of rolling juvenile tarpon still around but good luck getting close to them unless you're in a kayak or poling a very quiet skiff like mine. Tides will be excellent for them after sunrise over the next three days. Don't call Temple Fork's Prism fly reels cheap. That makes them sound poorly made, and they're not. They only cost between $85 to $100 so call them inexpensive instead. I just picked one of these up to use with my 9-wt BVK fly rod and it's a really nice combo. The Prism reels are made from cast aluminum which means they're poured into a mold which makes them very easy to produce. Higher end reels, like my favorite Tibors, are machined from solid bar stock aluminum, making them much more pricey. But don't get hung up on using a cast aluminum reel for saltwater fly fishing. Most of them are up to the task, especially the TFOs. The Prisms have large cork drags and a one way clutch making them more than capable of stopping a hard pulling redfish or snook. 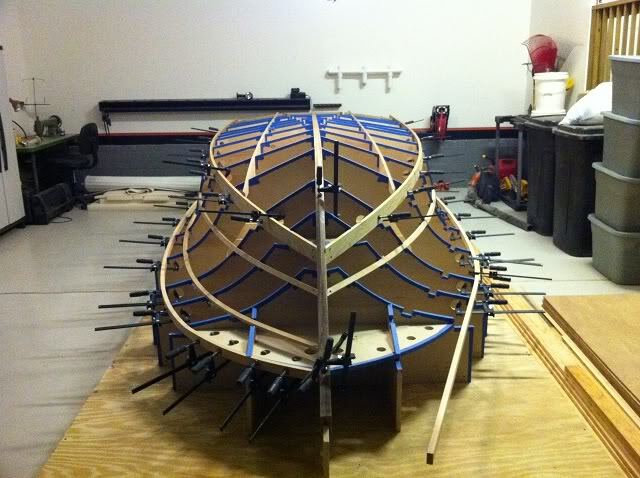 They can also pack a lot of backing, over 250 yards for the 9/11 model, which is a must for chasing big tarpon. I do recommend taking a little more care to rise cast aluminum reels off with warm water each time you use them. Most anglers do this anyway but if you're like me, rods and reels get left in the boat for days between washings. This has never bother my bar stock Tibors but you'll notice a bit of pitting after a while if you leave salt on cast aluminum reels. You can take a look at the new Prisms locally at Florida Paddlesports. They're more than enough reel for anything that swims around the flats of SW Florida. Riding High: The Best Tarpon Fishing Video Ever. Now this is how it's done! The guys from Waterline Media have put together something absolutely stunning in this 5 minute video called "Riding High: A Season On The Fly". From the photography to the editing to the narration, almost everything about this short film is perfect. I especially like the background music which is exactly what it's supposed to be: just music playing in the background. It's not a blaring rap song which instantly ruins these videos for me. And I really love the dog in this film. He's fantastic. Most of the scenes were shot in the Keys and Everglades but around the 1 minute mark you can see some great footage from Cayo Costa Beach, one of my favorite cruising tarpon spots in the summer. This is easily the best tarpon fishing film I've seen in a very long time. It's in the same caliber as Guy Valdene's 1974 classic "Tarpon" or a few select episodes of Flip Pallot's "Walker's Cay Chronicles." My only complaint about Waterline's video is that it's too damn short. I could watch two hours of this and still want more. Be sure to click on the bottom right icon and watch this in full screen HD. Photography is a becoming a bigger hobby of mine so I was really excited to discover Easy Canvas Prints. They can take any digital photo and reproduce it on canvas with two different border sizes. I chose a close-up shot of a tarpon I caught recently and had it printed as an 11x14 gallery wrap on a 3/4" frame. It's a simple four step process and I designed and ordered the print on their website in less than five minutes. I got the canvas a few days later and was thrilled with how it looked. The detail of the fish was exceptional, especially since I was only using a 10 mega-pixel camera and had cropped the image significantly. Using a 14 mega-pixel camera will produce even more impressive images on these canvases. This is a great way to create your own artwork at a really affordable price so check them out sometime, I plan on doing a lot more business with them in the future. I shot these this morning on my way to Useppa Island to pick up a charter. Fantastic. This 2/0 streamer pattern has been the money maker for the juvenile tarpon in Matlacha Pass and Pine Island Sound for the past two weeks. It's a creation of local fly tyer Jeff Ruppert. My buddy Mike Bartlett brought it up from Key West where he's been using it with great success down there, too. I've always been a fan of dark flies in dark water for tarpon but this pattern is changing my mind. This is for those of you who are beginners or are struggling with these fish here around Pine Island. 5 Ways To Catch More Tarpon On A Fly. 1. Use a lighter fly rod. You really don't need anything heavier than a 10-weight to catch the majority of tarpon you'll encounter off Pine Island. Mid-range saltwater rods are not only easier to cast but the lighter lines hit the water with less impact. This is less likely to spook these fish, especially given our calm conditions most of year. 2. Use a heavier leader. If you’re not trying to set a world record then there's no reason to use anything less than 20# test for your class tippet. In fact, I know several guides who simply use a single 9 foot piece of 30# fluorocarbon as their entire leader. This eliminates any knots and it's invisible in the water. 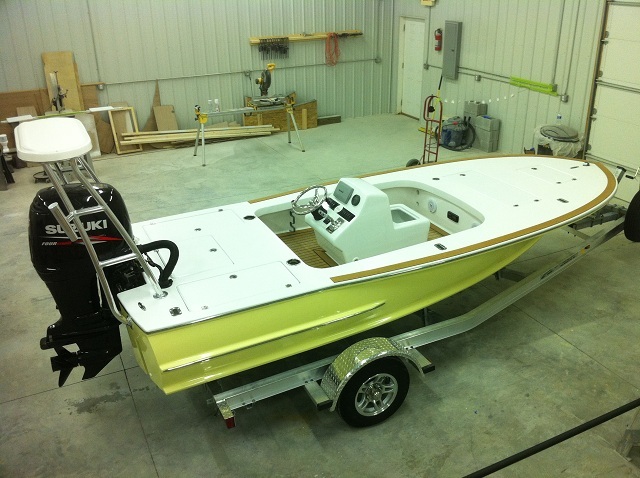 It's also more than strong enough to let you muscle a mid-size tarpon to the boat quickly. That's important since a long battle in the 90 degree summertime water is a sure way to kill these fish. Get them in fast and they won't become shark food after you release them. 3. But use a lighter shock leader. The straight 30# leader idea is great but I still like to tie in 18” of 40# fluorocarbon as a shock leader. Tarpon have a mouth that feels like a cinder block so something a little heavier at the hook stops them from rubbing through the leader. In the spring and early summer, when triple digit fish are around I'll bump it up to 60# fluorocarbon. In 15 years I've only had a handful of tarpon wear through that size shock leader. Use anything heavier and the fish is more likely to see it and less likely to eat the fly. 4. Use sharper hooks. It's hard to find a tarpon flies these days that aren't tied on pre-sharpened, cutting edged hooks. If you tie your own flies then spend the extra money and get the best hooks possible. My favorites are the SSW style Owner Cutting Point in 2/0 size. They're wickedly sharp and penetrate the tarpon's mouth better than anything else. They also have a small barb that holds beautifully but is still easily removed from the fish. A package of 8 costs around $5 but they're worth it. 5. Use your drag. When I was guiding down in Key West my buddies and I had a rule that three jumps from a tarpon counted as a caught fish. After the third jump, getting it to the boat was just a formality. Everyone should use this rule since it’s easier on the fish and the angler. As a beginner I lost many tarpon because I babied them during the fight. I'd give them too much slack and barely pull on them for fear of breaking the light tippets I used. In other words, I was so afraid of losing the fish that I'd eventually lose the fish. That changed one summer when I had a client get heat stroke fighting a big tarpon. While he chugged some ice water I covertly cranked down the drag on his Tibor reel, hoping the fish would break itself off before the guy dropped dead on my bow. Instead, my angler quickly found himself in complete control of the tarpon for the first time in over an hour. Five minutes later we had the 100 pounder next to the boat and both angler and fish survived the ordeal. Start off with a light drag but after that third jump don't be afraid to really crank on them. That’s right; a trash fish starts this list. Most anglers hate this species but have you ever caught a six pound ladyfish on a fly? I have, a few years ago in Puerto Rico, and it was insane. That was a near record ladyfish from the Caribbean but the two pounders that we routinely find in Charlotte Harbor are still a blast on light fly rod. They’ll hit anything and are great practice for beginners. If I was writing a list about spin fishing targets this fish would be #1. A barracuda will kill anything that it sees moving and can swallow in one bite. They run, jump, pull harder and faster than anything on the flats and look awesomely dangerous in photos. Basically, a full grown barracuda is like a Japanese movie monster with fins. Unfortunately, these fish are a real pain to hook on a fly because their eyesight is amazing and they’re very smart. They require 70 foot casts with long streamer flies tied to wire leaders. Throw in the fact that the Keys are the only place in Florida for big cudas on the flats and you’ve got a wonderful but aggravating species to chase with a fly rod. These fish are hard hitters on a wide variety of flies but not too much of a fight after that. A 7-weight is all the rod needed for this species and even the big gator trout that they catch on the east coast of Florida rarely run into the backing. But what they lack in fight, they more than make up for in looks and taste. The spotted sea trout is a beautifully marked fish and just as beautiful on the grill. 7. Snook. Why is the Godfather of inshore species not higher on my list? Because fly fishing for snook often requires a lot of very precise casting and they can be very particular when it comes to fly patterns. While you’re busy untangling your 20th cast from the mangroves, the guy chumming with pilchards in the bay boat next to you is getting tired of hooking them. A snook’s strike is amazingly violent and they pull harder than anything trying to get back under the bushes, so they’re a worthy fight. They’re also fantastic to eat but you can’t keep them until next year on the west coast of Florida. Bummer. This little hammerhead has always been one of my favorites on any tackle, and they love to hit flies as long as they’re dark orange. Down in the Keys we called them the “Poor Man’s Bonefish” because they gave the same long runs as that more glamorous species but were easier to find and more difficult to spook. They’re also somewhat safe to handle and look really cool in photos. The Holy Grail of Saltwater Fly Fishing is only number five on this list? That’s because going after permit with a fly rod is like scoring a date with a supermodel; it’ll cost you a lot of money and you still probably won’t get them to eat anything. Permit are actually very easy to catch with a spinning rod. Drop a live blue crab within six feet of one and they’ll grab it 90% of the time. But drop a perfectly tied Merkin fly on their nose and 90% of the time they’ll ignore it. So just like supermodels they’re snobby and one dimensional, but they’re also the most beautiful thing on the flats and all your friends will be jealous if you hook up with one. I love everything about them. For starters, they’re psychotic. If you cast a Barbie doll into a school of these fish, they’d all try to kill it. Jacks are the most indiscriminate eaters on the flats and, like barracuda, will basically hit any moving object that will fit down their mouths. They’re easy to find and they love crashing surface baits so that automatically puts them at the top half of this list. The crevalles don’t jump but they pull like a cross between a pit bull and a dump truck with failed brakes. If they were only good to eat they would rank a couple numbers higher. This is a fish so perfect for the fly rod that I’ve never even attempted to catch one on spinning gear, and I never will. Bonefish are stunningly fast, subtlety beautiful and a lot more willing to eat a fly than most anglers and guides would lead you to believe. Unfortunately their range is rather limited in Florida. From Biscayne Bay and south to the Keys is the only place you’ll regularly find them in the Continental U.S. although Hawaii has a decent population, too. No matter where you go to chase this species, it’ll be worth it. An eight pound bonefish will empty your reel faster than you’ll think possible and will do it in some of the prettiest water on Earth. This species has it all. The fly rod record redfish weighed over 40 pounds but you probably won’t see one that size around Pine Island. But you will see the most beautiful looking redfish ever around this part of Florida. Our dark tannic water draws out the deep copper color in these fish and makes them one of the most photogenic species to hook on a fly. Reds will hit most of the patterns in your fly box if the placement is right, even topwaters, and they pull like freight trains. They’re a lot more user friendly than bonefish so they’re a good target for beginners, too. Top it all off with the fact that redfish are fantastic to eat and you’ve got a near perfect species. This fish invented saltwater fly fishing. The first one ever caught on a rod and reel happened right here in Southwest Florida almost 150 years ago. The tarpon has long been called “The Silver King” and for good reason. Everything about them is majestic on any tackle but they really shine when hooked on a fly rod. No two tarpon are ever the same. You can chase the small ones almost year round on the flats, in the mangroves, and even the canals throughout Florida and the twenty pounders are the most acrobatic fish that will hit a fly. Springtime brings the annual migration of full grown tarpon starting in the Keys and working their way up the coast. A 100 pound tarpon on a fly rod is a very real possibility here around Pine Island and will easily be the crowning achievement of almost any angler’s career. They’re a catch and release species only but that doesn’t matter. If I had one day on Earth left to fish, I’d go after a tarpon.